In line with the Kingdom’s commitment to create a digital economy and fuel the region’s digital future, the Bahrain Institute for Banking & Finance (BIBF) introduced its first ‘Technopreneurship’ Programme, through an exciting workshop at the first day of MENA’s most exciting innovation festival, Unbound Bahrain, which took place on 6 & 7 March at Bahrain’s National Theatre in Manama. To start in June 2019, the BIBF Technopreneurship programme is targeted at Startups, SMEs and creative individuals who aim to learn the knowledge and skills that will prepare them to start their Technopreneurship journey. The workshop provided an introduction about the programme and what participants can expect to gain from joining the programme. Starting with learning the fundamentals of Technopreneurship, participants learned the full Technopreneurship process including designing the innovation, managing the project, applying suitable technologies, securing and promoting the ‘Technovation’. Furthermore, participants were able to learn from different experts and interact with officials and professionals who provided insights on how to take advantage of the available market opportunities and accelerate their Technopreneurship projects. 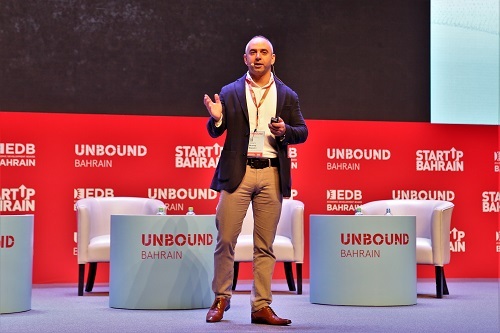 With more than 4000 startups, investors, and businesses, Unbound Bahrain is the anchor event of StartUp Bahrain Week, organised by Unbound, in partnership with Bahrain Economic Development Board (EDB), and supported by StartUp Bahrain. BIBF participated as the official Knowledge Partner for world-renowned innovation festival, Unbound Bahrain. To learn more and to register for the upcoming programmes, participants may contact BIBF Digital Transformation Centre team at +973 1781 5551, moc.f1555898879bib@e1555898879rtnec1555898879ti1555898879.